Drivers who miss between one to two hours of the recommended seven hours of sleep in a 24-hour period almost double their risk of a crash, according to safety experts in the United States. The CDC says 35% of U.S. drivers sleep less than the recommended seven hours daily. And with drowsy driving involved in more than one in five fatal crashes on U.S. roadways each year, drivers are warned that getting less than seven hours of sleep may have deadly consequences. Drivers cannot miss sleep and still expect to safely function behind the wheel and deal with challenges of heavy traffic. Research shows drivers who sleep for less than five hours have a crash risk comparable to someone driving drunk. The AAA Foundation for Traffic Safety’s report (in the USA), Acute Sleep Deprivation and Risk of Motor Vehicle Crash Involvement, studied drowsy driving. It found that drivers missing two to three hours of sleep in a 24-hour period more than quadrupled their risk of a crash compared to drivers getting the recommended seven hours of sleep. This is the same crash risk the National Highway Traffic Safety Administration associates with driving over the legal limit for alcohol. While 97% of drivers interviewed believed drowsy driving was unacceptable behaviour. Yet, almost one in three admitted to driving so tired they could barely keep their eyes open at least once in the past month. In a pressurised economy, managing a healthy work-life balance can be difficult. Far too often individuals sacrifice sleep in favour of some other activity. The net result is that failing to maintain a healthy sleep schedule means putting yourself or others at risk. More than half of drivers involved in fatigue-related crashes – according to the report – experienced no symptoms before falling asleep while driving. Do not rely on your body to provide warning signs of fatigue. Instead, prioritize getting plenty of sleep (at least seven hours) in your daily schedules. Until Next time – drive safe and sleep well. While the retail motor industry is admittedly slower than we would like it to be, the fact remains that new vehicles are being sold and will, for the foreseeable future continue to be. With all the options available to buyers today there are a few factors which should – subject of course to purchase price – determine what our new vehicle specs should be. Do this by asking some questions. – Autonomous Emergency Braking leads the way as a must-have feature on any new car. While this may be utopian and something to be aspired to we should at the very least ensure that we have ABS. – Manufacturers, dealers and fleet suppliers should be making it easier for consumers to understand what advanced driver assistance systems do and why they are important – as well as being absolutely clear about which cars have the highest standard safety specification. So often we find participants at our driver training programs that drivers don’t know half of what their vehicles are equipped with. Anyone responsible for buying a car for themselves, their family or their employees would be failing in their duty of care not to ask these questions. Till next time – Drive Safe and remember to ask the above. If self-driving cars become commonplace there will be at least one unintended consequence: it will eliminate a good way to assess the true character of a co-worker, colleague or customer. Just as anonymity on the Web allows petty cowards to express their hidden ugliness, the anonymity of being behind the wheel brings out the worst in some people. – Rolling Stops. People who don`t come to a full stop at a stop sign can`t be trusted to handle details. They literally and figuratively cut corners, both on the street and in the workplace. – Tailgating. People who tailgate (i.e. leave less than one car length) are unimaginative. They assume that nothing can go wrong and are caught by surprise when the unexpected happens. – Road Hogging. A road hog insists on going either below or at the speed limit rather than pulling over and letting a line of cars pass them. This is classic passive-aggression; road hogs will bog down any and all initiatives at work. – Finger Salutes. People who feel it necessary to express profanity at other drivers (especially while driving away) are usually frustrated and a bit cowardly. At work, they can be counted on to backbite and gossip. – Over-honking. These are people who honk longer than necessary, like a full second (rather than a polite tap) at a driver who hasn`t noticed the light has changed. Over-honkers tend to be both overly-critical and overly-sensitive to being criticized. – Texting. Driving while texting is more dangerous than driving while drunk. Anybody who texts or emails while driving is a dangerous fool and cannot be trusted with any responsibility whatsoever, at work or anywhere else. – Speeding. Habitual speeders don’t really care about other people and they don`t think the rules apply to them. At work, they are the jerks that make everyone else miserable. If nothing else the above should encourage lively debate and if circumstances permit the opportunity to point out the need for some changes in habits. Till next time, remember – We all send out messages, some good some not so good. Are children counted in determining the number of passengers allowed in a vehicle? Has anyone else noticed how aggressive South African drivers are? Having driven in other parts of the world where drivers tend to be more tolerant and understanding of other drivers’ errors, one can’t help but wonder what the world’s largest users of vehicle shows. A study undertaken in the US reported that almost 80% of drivers had been involved in an aggressive action. The purpose of this study was to provide estimates of the prevalence of aggressive driving behaviours. The data analysed were collected via a nationally-representative online survey of 2,705 licensed drivers aged 16 and older conducted in the United States in 2014. Seventy-eight percent of U.S. drivers reported having engaged in at least one aggressive driving behaviour at least once in the past year. Approximately one-third of all respondents indicated that they had made an angry gesture at another driver. Approximately one in four drivers reported that they had purposely tried to block another driver from changing lanes, and 11.9% reported that they had cut off another vehicle on purpose. A small proportion of drivers even admitted to engaging in behaviours beyond the scope of general aggressive driving and which may be considered road rage: 3.7% of drivers reported that they had exited their vehicle to confront another driver, and 2.8% reported that they had bumped or rammed another vehicle on purpose. Shocking, I am sure you will agree. While we don’t have any meaningful data in South Africa, I am sure that our own assessment of where we stand could well give us some ‘anecdotal’ information – and hopefully change our own behaviour. The quiz link below is broken up into four individual sections that rate the following characteristics of aggressive driving: Anger, Impatience, Competition, and Punishment The sections contain 10 questions each, and at the end of section you will receive a Low, Moderate, or High rating for aggression based on your answers. Receiving a moderate or high score for any section means that you have aggressive tendencies on the road and might need to take measures to reduce that aggression. Tips and feedback follow each section. Till next time – Drive Safe and “keep your cool”. MASTERDRIVING Alerts – Are parents negatively impacting learner drivers? Given that many cash strapped parents elect to “teach” their children how to drive, one can only imagine the challenges they experience – are they any good at It? Quite possibly but research overseas seems to indicate otherwise. One in two learner drivers (54%) have been out on the road with their parents despite many mums and dads showing a lack of knowledge of basic driving best practice, with one in five admitting that they are not sure whether they would pass a driving test if they had to take it again. When questioned, 76% of parents believed that they were up-to-date with the latest rules and could provide their children with adequate instruction. However, when quizzed on particular facts it showed that many were off target when shooting for the right answer. Young Driver offers driving tuition to 10-17 year olds across Britain, and surveyed more than 1,000 people to get these results. Mirror, signal, and manoeuvre – more than a third of parents have forgotten this basic rule, despite it being the cornerstone of good driving. While one in two forget to teach their children about the importance of checking dangerous blind spots. Steering – Four out of five parents (82%) wouldn`t teach the push-pull technique favoured by instructors. Gear changes – 38% would insist the learner moved up and down the gears sequentially (1-2-3-4-5-6). However, block gear changing is now considered acceptable in many situations. Hand position – despite many of us being taught that hands should be kept on the steering wheel at the 10 to two position, that advice has been revised over recent years. It is now recommended that hands are in the quarter to three position, to maintain control and to prevent a serious injury should an airbag deploy. Some 46% of parents admitted to insisting their youngsters use the original ten and two placement they`d been taught in the pre-airbag era. Manoeuvres – One in five would be adamant that a turn in the road was a fail unless it was completed in three manoeuvres. In fact, the modern test allows for up to five turns, hence, it no longer being called a `three point turn”. Assisted technology – One in four would insist young drivers didn`t use parking sensors or cruise control to help with their driving, but these are perfectly acceptable in a test situation when used appropriately. The research also discovered that dads are twice as likely as mums to take their child out for practice, with the majority offering additional experience lessons alongside ones with their driving instructor. One can only wonder what a survey in South Africa would show. Given that upwards of 50% of licences have been obtained fraudulently it is likely that if those parents were “teaching” their children the results would be horrendous. For any parents wanting some advice, feel free to contact our MasterDrive K53 approved training program. Till next time – Stay with what you know. Drivers seem pretty comfortable lighting up a smoke, changing stations on the radio or chatting on their cell phones while navigating the streets. But brain researchers say it`s a terrible idea to do more than one thing at a time particularly using a cell, even with a hands-free device. “If you`re driving while cell-phoning, then your performance is going to be as poor as if you were legally drunk,” says David Meyer, a psychology professor at the University of Michigan. “If you test people while they`re texting or talking on the phone, they will actually miss a lot of things that are in their visual periphery,” says Earl Miller, a neuroscientist at the Massachusetts Institute of Technology. Driving requires a surprising amount of brain power. Out on the road, we have to process huge amounts of visual information, predict the actions of other drivers and coordinate precise movements of our hands and feet. Even when using a hands-free device, scientists have found that talking on the phone distracts us to the point where we devote less brain power to focusing on the road. Marcel Just, a neuroscientist at Carnegie Mellon University, says that`s why people learning to drive don`t do anything else. “Novice drivers turn off the radio, they ask you not to talk to them. They need all the brain participation they can get for the driving,” Just says. But the level of focus required changes with experience. Over time, the brain rewires itself to do the tasks involved in driving. So when our eyes see a red light, our foot hits the brake, with no conscious thought involved. Driving becomes automatic. Scientists call this phenomenon “automaticity.” It lets us do one thing while focusing on something else. In other words, learning to do one task automatically helps us to multitask. If the brain is so good at this, why not chat on the cell phone while driving? Experts came up with a demonstration that`s a bit more refined. A professional pianist was brought into a special studio. For over an hour, the musician was tasked with playing a range of pieces, some he knew and some he had to sight-read. While he was playing, he was asked to multitask. Sometimes the additional work was simple. But when the challenges took more brain power, it was tougher for the musician to answer questions and play the piano at the same time. There`s a lot going on in the pianist`s brain. Several circuits are busy decoding and producing language. And that`s only the beginning. Neuroscience studies using brain scans have shown that the brain struggles with paying attention to sights and sounds simultaneously. When the brain starts working on a visual task, its auditory parts show decreased activity, and vice versa. A multitasking driver might have hit something else. The musician, who was already working hard to follow the music, simply couldn`t handle something else that required real thinking. It`s like driving on an unfamiliar road and getting a cell phone call from an angry spouse. You may not notice that stopped car up ahead. In fact, driver inattention is involved in about 80 percent of crashes, according to a 2006 study by the National Highway Traffic Safety Administration. The 100-Car Naturalistic Driving Study found the most common distraction for drivers was use of cell phones — with the number of crashes attributable to dialling nearly identical to the number associated with talking or listening. What was learned from the experiment was that multi-tasking, while thought to be possible by many is in reality not realistic. The brain must switch modes. Switching modes takes time — maybe only a quarter of a second. But on a highway that means you`ve gone an extra 20 meters before you hit the brake. So next time you feel tempted to try and engage with your phone while driving, remember that people – far cleverer than you or I have proved it doesn’t work – the infographic below shows this clearly. Till next time – Don’t take your eyes off the road or your hands off the wheel, if fact – Just Drive! Winter driving brings many challenges, one of which is that drivers spend more time driving in the dark. This creates a totally different set of challenges as one’s “risk” increases dramatically. Some of these are physical, while others are security issues. After the sun goes down, a driver’s depth perception, colour recognition, and peripheral vision are all compromised. In addition, the driver is more likely to share the road with impaired and fatigued drivers, noticeably on many of our long distance routes. According to research in the US, road fatalities are three times greater at night. In SA one can only imagine that this may be even worse due to the high incidence of pedestrian deaths. Here are some night-time driving tips from MasterDrive which we trust will make the journey somewhat safer. – Make sure your headlights are set correctly and that they’re clean. – Many dashboards have the option of dimming the instrument lights – if so, dim them for improved visibility. – Don’t look directly at oncoming lights. Look to the left of the road as you will be able to see the side of the road and keep yourself orientated. – Make sure the windscreen is clean – it’s amazing how much strain a dirty screen puts on the eyes. – Slow down to compensate for limited visibility and reduced stopping time. Till next time – Remember to adjust your driving to suit changed circumstances. Most people would like to believe that they are the “perfect” role model and that their children should, in all likelihood, emulate their actions. Besides which they are the most important people in the world to us as we worry about them being hurt on the road or killed in a car crash – with good reason, reflecting on our tragic record of road safety. Parents often say they would do anything to keep their children safe. So what can you do, while driving, to keep your children safe? Many responsible parents repeatedly warn their teens not to drive distracted. But it’s not enough to just tell them. We must show them. Experts tell us that once we turn our children’s car seats so they face forward they begin to learn how to drive by watching us. Have you taught your children that it is okay to eat, apply make-up, talk or text on our phones while driving? While no one, including adults who are experienced drivers, should drive distracted, distracted driving is particularly dangerous for our children who are the most inexperienced of drivers. Recent studies in the United States indicate that distraction may be responsible for as many as 50% of serious teen crashes. Teens whose parents drive distracted are nearly three times as likely to also drive distracted. “Do as I say and not as I do” is a risky way to teach your children to be safe drivers. Model distraction-free driving every time you drive with your children. If you have driven distracted with your children in the car tell them, you were wrong to do so and that you want them to help you drive safer. Asking them to remind you to drive safer empowers them and reduces the chances that they will drive distracted. A perfect way to have the discussion is to use the Family Safe Driving Agreement (if any reader would like a sample please contact us) to reach an agreement for how you and all members of the family will drive. Even if your children are not yet driving, discuss distraction-free driving with them. Doing so will not only help them keep you from driving distracted, but also will prepare them to speak up when others try to drive them whilst distracted. By modelling distraction-free driving every time you drive you will give your children a gift they can live with. If you want to view a video entitled “Parents, be the driver you want your teen to be, “please mail us. Most drivers are aware of the need to use indicators (turn signals) and probably agree that they know the reason why these are installed in motor vehicles- Yes, No? Sadly, while most use them, very few do so in the correct sequence as defined by the “system of car control” as advocated by proponents of defensive driver training. The necessity of their use is highlighted by a recent survey in the UAE which showed that a major cause of car crashes can be attributed to poor use of indicators. This has been revealed in a survey of drivers in the UAE by YouGuv, carried out on behalf of Qatar Insurance Company and RoadSafetyUAE. – 90% of drivers responding to the survey said they believe that using indicators helps to improve road safety. The survey also mentioned that 78% of drivers aged 40 and older use indicators while only 56% of drivers younger than 40 do so. According to the data from the UAE’s Ministry of Interior`s statistics, 21% of road crash fatalities in the UAE are caused by swerving from a traffic lane. And failure to use indicators properly is a key factor in crashes arising from lane departure. In the light of these statistics (sadly none of which are available in South Africa) we can be well advised to ensure that we make it a practice. Till next time – Drive in a manner that communicates your intentions to other road users by using your indicator. According to some industry experts, rear-end collisions on the highway between Johannesburg and Pretoria (Ben Schoeman), account for some 80% of crashes. Common to almost all of these incidents is the fact that these are caused by incorrect following distance. While we have identified the aforementioned as a primary reason there are other factors, so for convenience, we have highlighted, what we think are other contributory factors. As organisations develop their fleet safety programs and the type of training their drivers should receive, they need to understand these common factors and align programs to include same. Because fleet drivers have higher exposure (up three times according to experts), and hence three times the risk of getting into a rear-end collision greater attention must be paid. It is no surprise that (ultimately) the leading cause of rear-end collisions is distracted driving as a result of drivers trying to use a GPS app or make a call and as a result they may take their eyes off the road. As winter sets in, with decreased hours of light, a driver needs to adjust his or her driving behaviour to accommodate this in everyday driving. The main takeaway for fleet drivers is to remain alert at all times. Cell phones, sipping coffee, or changing the radio station can wait. Keeping their eyes on the road and being aware of their surroundings takes precedent. Many fleet drivers and sales persons who are on the road a lot have forgotten that, when they are behind the wheel, that’s not the office, it’s time to drive. The practical approach to preventing rear-end collisions is providing driver training. In the Company context Fleet managers can introduce this training as soon as the driver is hired. If fleet drivers aren’t doing the training, or a strong emphasis is not being placed on safety, then there will be a rise in collisions and expenses among many fleet owners. There is also technology available to fleets that can aid in the prevention of these collisions. Collision avoidance systems (CAS) that are being equipped on some vehicle line ups or plug-and-play devices can make a real dent in the frequency of rear-end collisions. Another more common way a driver can prevent distracted driving is to put his or her phone on airplane mode, this will help eliminate the urge to look at the phone or text. The best preventative measure that fleet managers can take, while relatively expensive, is to integrate vehicles into their fleets that are equipped with autonomous emergency braking and collision avoidance systems — either from the OEM or an aftermarket provider. Other contributors to rear-end collisions are speeding, tailgating or hazardous weather but as indicated at the outset, too close a following distance (which can be caused by any one or combination of the above) is the one that causes the most chaos on highways. Till next time – Be sure to keep an eye on what`s going on in front and behind you. We are heading – pretty quickly – to the spate of long weekends and the inevitable increase of traffic on the national roads. This often means more adult passengers riding in the backseat as families’ head to holiday parties, shopping centres and seasonal charity events. Unfortunately, far too many adults neglect to buckle up when they travel in the backseat, despite the fact that rear-seat passengers are three times more likely to die in a crash if they’re unbuckled. When viewing the infographic, it demonstrates that South Africa is a long way off the utopian levels for wear rate. According to the Road Safety Foundation’s Phillip Hull, a survey in 2012 recorded the following wear rate – 54% for drivers and 39% for front passengers. Unfortunately, the method of recording the vehicles did not allow for showing rear seat passengers which, one can only imagine, must be shocking. This compared with seat belt use in the US of 87 percent for the front seat and adult rear-seat passengers of 78 percent. According to the Governors Highway Safety Association (GHSA), the discrepancy is even more pronounced in vehicle crashes involving a fatality: 60 percent rear-belt use versus 74 percent in the front. Criticise as much as we want and question whether Law enforcement is doing their job, the fact remains that fatalities on SA’s roads could be reduced if motorists simply used the resources at their disposal – This is why it’s important that all companies ensure 100% compliance with policies, part of which will address ‘absolute rules” such as seatbelt wearing. Drivers should be admonished to make sure all passengers, including those in the backseat, buckle up each and every trip. With that somewhat sombre approach to the excitement of long weekends we encourage all to make it their mission – this time round – to strongly advocate wearing a seat belt. Till next time – Drive Safe and make sure all passengers, especially the kids, are strapped in. There are some really “choice” expressions that South Africans use when driving, some of which are no doubt a reflection of frustrations, dissatisfaction or pressures brought about while working. While we have been advised that these are precursors to possible road rage, we may not have put them into perspective from the likelihood of being involved in a crash. According to new research from the Virginia Tech Transportation Institute, drivers increase their crash risk nearly tenfold when they get behind the wheel while visibly angry, sad, crying or emotionally agitated. It was also discovered that drivers more than double their crash risk when they engage in distracting activities that require them to take their eyes off the road, such as using a cell phone, reading or writing, and using touchscreen menus on a vehicle instrument panel. This research revealed that drivers dialling a handheld cell phone increase their chance of crashing by 12 times. Reading or writing, including on a tablet, increases crash risk by 10 times. 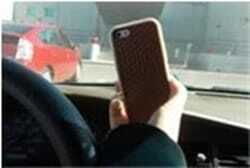 Reaching for an object (other than a cell phone) bumps up the crash risk by nine times. According to the institute’s research, drivers in the country surveyed engage in some type of distracting activity about 52% of the time while operating a vehicle. One can only but imagine what the percentage of South African drivers would be – how much higher? These findings are important because there is an ever increasing younger population of drivers, particularly teens, who are more prone to engaging in distracting activities while driving, and the analysis shows that, if we no steps are taken in the near future to limit the number of distracting activities in a vehicle, those who represent the next generation of drivers will only continue to be at greater risk of a crash. Of interest was how traveling well above the speed limit creates about 13 times the risk, and driver performance errors such as sudden or improper braking or being unfamiliar with a vehicle or roadway have an impact on individual risk, according to researchers. No doubt the following observations will please female drivers who are pretty much “stereotyped “as researchers also found several factors previously thought to increase driver risk — including applying makeup or following a vehicle too closely — actually had a lower prevalence in the driving study. That means they were minimally present or were not present at all in the crashes analysed. Male drivers be warned! All things considered then, the message we take from a study such as this is that while some behaviours can be corrected by training there are some which can – and should – be addressed by taking a check on our emotions (or letting a friend or family members ‘words of wisdom’ sink in) before getting behind the wheel. Till next time – Take care and get a grip on your emotions when driving; a friendly reminder from your partner in driving. There are a number of things we take for granted in new vehicles which, because of the modern world we live in, hardly warrant a second thought. One such feature is Head Restraints. Research from the US reveals that vehicle seat/head restraint combinations reduce injury claim rates by 11.2 percent, compared to vehicles with poorly rated restraint combinations. The study, released by IIHS (Insurance Institute for Highway Safety) and the Highway Loss Data Institute, concluded that top-rated restraint combinations markedly reduce the likelihood that someone will sustain neck injuries if rear-ended by another vehicle. The study also underscored the dramatic improvement in such restraint quality in today’s vehicles. A decade ago, IIHS said, more than half of the seat/head restraints the institute evaluated were rated “poor” and just 9 percent drew a “good” score. In contrast, 95 percent of 2015 models earned a “good” rating and none were rated “poor.” IIHS credited its own ratings program, combined with stricter federal requirements for higher front-seat head restraints, for the overall improvement in such occupant protection. In the U.S., whiplash injuries are the most frequently reported type of injury resulting from crashes. For the recent study, researchers used an insurance claim database of more than 600,000 rear-impact crashes to assess the likelihood of an associated injury claim. Statistics were based on study results on 2001-2014 model-year cars and SUVs using property damage liability and personal injury protection claims. The safety benefit of higher-quality restraints was even more pronounced among women, who saw lower injury rates with “good,” “acceptable,” and “marginal”-rated seats compared with “poor”-rated seats. For men, only “good”-rated seats were tied to statistically lower injury rates. Females are believed to be at a higher risk for neck injuries because of several physical differences, the study noted. “Injury rates were 13 percent lower for women and 9 percent lower for men in vehicles with good-rated seats/head restraints,” IIHS said. Given the fact that South Africa has an aging vehicle population and that many persons are transported in Mini Bus Taxi’s one can reasonably conclude that our statistics would be no better. While we may not be able to do anything about the vehicle itself, we can work on changing driver behaviour which contributes some 80% to the causes of crashes. Question: Have you or your staff ever been enrolled on a defensive driving course? If not, it should be considered an investment – both financially and lifesaving. Till next time – Drive Safe and ensure that your head restraint is adjusted correctly so as to minimise possible whiplash injury. Following on from last weeks’ newsletter on the true extent of a distracted driving action we share some positive comments on dealing with this challenge, particularly from a cognitive perspective. Mitsubishi Electric Corporation has announced it has developed a technology to detect absent-mindedness and other cognitive distractions in drivers when their vehicles are traveling straight, using a type of machine-learning algorithm known as deep learning. The company believes this is a first in the automotive industry. Although systems exist to detect drivers who are visually distracted due to drowsiness or inattentiveness, the detection of cognitive distractions has been difficult because symptoms sometimes appear in a driver’s behaviour or biological patterns, rather than in their face or eye movements. Mitsubishi Electric said its new technology uses a machine-learning algorithm to analyse time-series data, including information about the vehicle (steering, etc.) and driver (heart rate, facial orientation, etc. ), to detect and warn drivers about potentially dangerous indications. The machine-learning algorithm uses a combination of data on “normal driving” and time-series data on the actual vehicle and driver to predict appropriate driver actions in real time. The technology detects cognitive distractions if the driver’s actions differ drastically from the algorithm-based prediction of what would be appropriate. If a distraction is detected, the driver is alerted immediately about their potentially dangerous driving, according to the company. The technology was displayed at the 44th Tokyo Motor Show 2015. Technologies for detecting cognitively and visually distracted driving are expected to be installed in driver sensing units sold commercially from around 2019 or beyond, according to the company. Until that happens drivers should take cognizance of how serious a problem DWD is and therefore be committed to avoiding behaviour that would compromise safe driving. Till next time – Drive Safe and stay off the phone. We recently participated in the development of a series of infographics and posters on the dangers of DWD and therefore take note of new information on the subject – information that lends clarity, perspective and above all renewed commitment to support drives against DWD. 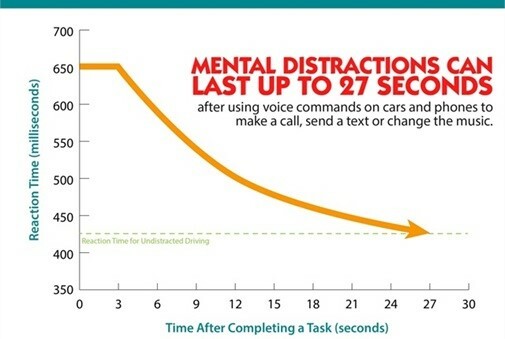 Potentially unsafe mental distractions can persist for as long as 27 seconds after a driver engages in some or other form of DWD, according to new research by the AAA Foundation for Traffic Safety. The study results raise new and unexpected concerns regarding the use of phones and vehicle information systems while driving… This research represents the third phase of the foundation’s investigation into cognitive distraction. Results show that new hands-free technologies can mentally distract drivers even if their eyes are on the road and their hands are on the wheel. Researchers found that potentially unsafe levels of mental distraction can last for as long as 27 seconds after completing a distracting task in the worst-performing systems studied. At the 25 mph (40 kph) speed limit in the study, drivers travelled the length of nearly three soccer fields during this time. When using the least distracting systems, drivers remained impaired for more than 15 seconds after completing a task. Using the phones to send texts significantly increased the level of mental distraction. While sending voice-activated texts, Google Now rated as a category 3.3 distraction, while Apple Siri and Microsoft Cortana rated as category 3.7 and category 4.1 distractions, respectively. Previous AAA Foundation research established that a category 1 mental distraction is about the same as listening to the radio or an audio book. A category 2 distraction is about the same as talking on the phone, while category 3 is equivalent to sending voice-activated texts on a perfect, error-free system. Category 4 is similar to updating social media while driving, while category 5 corresponds to a highly challenging scientific test designed to overload a driver’s attention. This research is but part of what is being “unearthed” in studies being conducted around the world. In reality we probably don’t expect any justification for using and/or engaging in anything that would distract us but why aren’t we prepared to change bad habits? Many have, so why not work toward encouraging (could even be yourself) to pledge to not misuse a cell phone. Till next time – Drive Safe and pledge to be different. Summer is here and while we look forward with keen anticipation to the relief the summer rains will bring, we also anticipate that problems will evidence themselves, particularly when we have a “cloud burst”. The tips listed below were certainly of value with the recent ‘flash floods’ experienced by South Carolina and North Carolina residents in the USA where no less than the lives of at least five people were lost due to flooding. TV footage of some dramatic rescues provided a reminder of how dangerously powerful floodwaters can become during heavy rainfall. Now is a good time to remind drivers that flash flooding can occur with little, if any, advance notice. Drivers need to take the proper precautions before and during such emergency conditions. > In heavy rain, reduce speed and leave more space between you and the vehicle in front to account for greater stopping distances. > Look out for trucks or fast-moving vehicles creating spray, which reduces visibility. > Driving too fast through standing water could lead to tyres losing contact with the road surface. If there is a sudden “lightness” in steering you could be aquaplaning, also known as hydroplaning. To regain grip, ease off the accelerator, do not brake, and allow your speed to drop until you gain full control of the steering again. > Do not attempt to drive through water if you are unsure of the depth – in suburban roads look to the side as the edge of the pavement is a good indicator. On country roads this may not be possible. 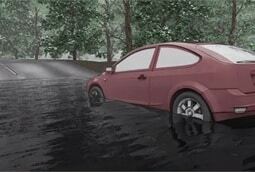 > Never attempt to drive through fast flowing water – your vehicle could easily get swept away. > If your vehicle becomes submerged, first of all stay calm. Remain buckled in your seat. If the water is substantially deep, the car should remain afloat 30 to 60 seconds — long enough for you to escape. > In this situation, many people believe if they are wearing a seat belt they will not be able to unbuckle it and will be trapped in the vehicle. Not true!!! A seatbelt is designed for quick release, and without it there is nothing to hold you in place, nothing to keep your head from slamming into the steering wheel or dashboard. (Hitting water at speed is the same as hitting a wall.) If you were knocked unconscious, you would be helpless. You wouldn’t have a chance to save yourself, let alone help anyone else. If you and any passengers are wearing seatbelts, chances of survival are much greater. > Immediately unlock the doors and open the windows. Your car’s power accessories should continue working for at least a minute or so. > Unbuckle your seat belt (and those of children or other riders who need assistance) and exit through the open windows, swimming to safety in the direction of the current if you’re in deep water. > If the windows won’t open, try kicking out a side or rear window, though it won’t be easy. > You may want to think about carrying a small hammer or car window-breaking tool like a spring punch or hammer in the cubby hole for this purpose. > If you can’t leave via a window and water is entering the cabin, wait until the pressure is equalized on both sides of the door (usually when it’s as deep inside as it is outside) before attempting to open it. These tips are of course far from “perfect” but are useful guides for inexperienced drivers. That said one should never ever land up in that situation in the first place – prevention is better than cure. Till next time – Enjoy the rain but be warned, water can be dangerous to drivers. With companies taking infrastructure into undeveloped areas we are receiving more requests for information on the above topic. For those who like to keep themselves informed the following should prove of interest. There may be times when fleet drivers find themselves traveling on rural roads or unpaved private roads. These roads can present some driving hazards not normally found on highways and city streets. So here are nine safety tips about dirt road driving. You may want to pass this advice along to those drivers who encounter these roads – as a friendly reminder. 1.When driving on dirt (also referred to as gravel), always slow down. The vehicle will take much longer to stop on gravel, and the likelihood of skidding when turning is much higher. Stopping or turning on loose gravel is more difficult compared to tar because there’s less tyre traction. Skidding can occur as traction diminishes. A driver can also experience a “washboard” effect on dirt roads. This is a series of corrugations that can affect steering and vehicle control. The way ABS works on these surfaces is of course a discussion on its own. 2.Keep headlights on (if not doing so already) to make your vehicle more visible to others if the dirt road is dusty. Particularly during dry periods of the year, dirt roads can become extremely dusty and affect visibility. 3.Look for “Narrow Bridge” or other signs that indicate the presence of hazards (particularly the one showing animals jumping) and be prepared to stop for oncoming traffic. Dirt roads often have little to no shoulder and ditches on the side can be very steep and dangerous. 4.Before reaching the crest of a hill or before entering a curve, slow down, position the vehicle so as to maximise the view of the road ahead and watch for oncoming vehicles. Hills and curves in rural areas are often steeper and sharper than on highways. 5.When approaching a railroad crossing, always slow down, look both ways and be prepared to stop for a train before crossing the tracks. 6.When approaching an uncontrolled rural intersection, slow down and be prepared to stop for oncoming traffic. Some intersections in rural areas aren’t controlled by yield or stop signs. These intersections can be very dangerous if you don’t approach them with caution. 7.Look out for blind spots. Intersections, hills and curves become even more dangerous when such objects as trees or maize fields block your view of oncoming traffic. 8.Slow down whenever you encounter slow-moving farm tractors, animal-drawn vehicles or road maintenance equipment. Slow-moving equipment may make very wide turns, either left or right, at unmarked entrances. Always use extreme caution when passing them. Make sure the other driver sees you before attempting to pass. 9.Look out for animals, especially at sunrise and sunset. Though animals can be found on any roadway, you’re more likely to see them in rural areas because such roads often extend through wildlife habitats and are close to farms and livestock. If you spot an animal, slow down and be prepared to stop. If there isn’t time to stop or avoid the animal, don’t swerve sharply. Resist that instinct. Your chances of getting injured are much greater if you swerve into oncoming traffic or roll the vehicle over in a ditch. While this is not an exhaustive list, this will be an additional benefit to drivers who are new to the experience. Till next time – Drive Safe and remember different conditions may demand more diligence. There was a time when it was believed that human error accounted for 80% of crashes. Sadly it appears that the statistic is somewhat out of date as the latest research from the UK seems to indicate that 90% is the norm. The first area to consider is the skill the driver has in controlling the vehicle. While most drivers have reasonable driving skills, and are able to make the vehicle go where they want it to without colliding with anything else, this is generally only the case when they have enough time and they are concentrating on the task. Whether or not a driver has had professional driver training/lessons, or was taught by family or friends, once the psychomotor skills associated with driving such as pressing the brake, finding the biting point of the clutch and using the steering wheel are mastered, driving a vehicle becomes relatively easy. Loss of control will always feature in a crash but it is rarely the root cause. The second area to consider is how drivers interpret and adhere to the rules of the road. Irrespective of how well read they are, most drivers are aware of and understand the greater majority of the rules ( certainly the speed limits ) and procedures but they don’t always follow them. After all when learning to drive many of us are taught how to follow the rules to pass the test, the question is, what weren’t you taught during your lessons? Were you taught about being considerate to others and how to avoid feeling road rage? Did your instructor teach you all about time management or dealing with and managing fatigue? By learning to effectively manage factors like these,we can become safer, better road users. It is estimated that in SA we have some 9 million registered vehicles on our roads – let’s not forget those that should be counted which ‘visit’ us. This leads us on to the third area to consider: the reason and context of the journey. When you’re stuck in traffic or waiting for that green light, do you ever wonder why the driver in the next car is on that piece of road at that moment in time and what pressures they may be affected by? It could be a familiar journey for them and they may have become complacent, losing focus on the driving task. It could be an unfamiliar journey in an unknown town and they may even feel anxious, trying hard to fit in with and assess the traffic flow, gathering and processing high volumes of information and making quick decisions. The driver may also feel under pressure to drive in a particular way, such as the obligation they may feel to arrive on time, perhaps to catch a plane or maybe a job interview or even the peer pressure of a passenger in a similar situation. Whatever situation we find ourselves in on the road, we use a lot more than the basic car control skills we developed when we were learning to drive. After all, stopping a car should be easy; we’ve been able to stop the car since day one of our driving lessons. So why do so many of us nip through on orange and why do so many drivers end up using the rear bumper of the vehicle in front to stop? Is it due to their poor car control skills or something far more dangerous? This leads us on to the fourth, final and probably most important area to consider: attitude, beliefs and the way we choose to live our lives. Everyone has a set of values and motivations that guide us through life. These same things also influence and drive certain behaviours when we’re behind the wheel. If you’re a methodical, laid back and relaxed person, you’re likely to drive differently to an impulsive, bungee-jumping adrenaline junky. We all have personality traits that are conducive to safe driving and those which perhaps are not. It is up to us to be honest, to recognize which is which andcrucially, do something about it. To conclude, our personality and the way we choose to live our lives will usually always inform the context of the journey, influence whether we choose to follow the rules and procedures and maintain the best vehicle control we are capable of. The true root cause of almost all crashes is thebehavioural choiceswe as drivers make every time we drive. With such sobering thoughts – Remember, Drive Safe and keep your cool. This last week, traffic in Gauteng has been “horrific” with traffic jams and countless hours lost – mainly as a result of vehicle collisions and breakdowns. What could have been done different? Pay attention. That’s right, simple but really effective. The primary attribute necessary for safer driving is alertness. This allows you to see, recognize and avoid the unexpected hazards (such as a stopped vehicle) lurking on the road. Allow enough space ahead. 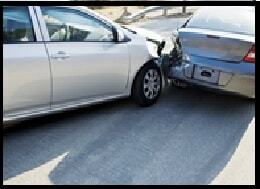 About 30 percent of crashes involve rear-end collisions. Many of these could be avoided by following at a safe distance. Allow at least three seconds between your vehicle and the car ahead of you. At highway speeds, lengthen the gap to four seconds or more. (The 2-3 second rule of decades past has been updated to the 3-4 second rule.) If you’re driving in the rain or poor weather conditions, lengthen that gap to six or more seconds. Also, you may need to adjust for vehicle weight, a major factor in how long the vehicle takes to stop. The heavier the vehicle, the longer it takes to stop. Look ahead. Scan the road and surrounding area at least 15 to 20 seconds ahead for potential road hazards, conditions and information that can help you plan a clear path to travel. Look around and keep your eyes open for approaching vehicles, pedestrians or animals that might enter your path. Have an escape route. The best way to avoid potential dangers is to position your vehicle where you have the best chance of seeing and being seen. Check your mirrors (don’t forget the blind spot check when changing lanes) every few seconds to see what is beside you and what is behind you. You need to have an alternate path of travel, taking into consideration the position of the vehicles around you and the road ahead. That’s crucial for deciding where you can manoeuvre safely to avoid a crash. If the road is narrow and lacking a shoulder, increase you’re following distance. Don’t be guilty of DWD. A simple thing such as not using the cell phone will eliminate some 25% of crashes. As the winter days shorten drivers should also take note of changing light conditions which could impact on changing hazards – think of being blinded by the rising or setting of the sun. All the above sounds quite simple but nonetheless effective in avoiding crashes and all the subsequent challenges associated therewith. Till next time – Take Care and Drive in the moment! Are you guilty of “abusing” your mobile phone? Possibly justifying it on the basis of your need to keep in contact with customers and, and, and………….. This newsletter is here just for you and (if you really are not guilty), for sharing with anyone else. Reduced to just 7 points, surely this must be a relatively easy task – or is it? The text you just received can wait. Try putting your phone in the backseat out of reach, or just turn it off. When you get to your destination, you can read your messages and respond. Know where your important stuff is before beginning your drive, so you’re not searching for something while driving. Program your navigation system, have your toll money ready, etc., in advance. Multi-tasking while driving takes your eyes and attention off the road. Taking a road trip with a co-worker? Ask your passenger to program the navigation system, find a decent radio station, or text the boss an update. Don’t use a road trip to engage in a conversation likely to cause conflict or stress. That`s a recipe for major cognitive distraction. Save the “we need to talk” moments for later, whether the context is personal or professional. They’re great technologies, but hands-free texting and talking are still distracting. Your hands may be on the wheel, but your mind and attention are off the road. So use them only when you absolutely must. We all need our quiet moments of the day, and while most of us don’t think of drive time as relaxing, remember that it’s OK to turn off the radio, pause the iPod, or ask your passengers to keep quiet. It can be relaxing to collect your thoughts and focus on the single task at hand. Till next time – Drive Safe and bag the phone! It is amazing how far we have come in understanding challenges regarding vehicle crashes, but more importantly, what the impact is on the driver. Latest research from Toyota helps us further understand the dynamics of what happens in a crash and as a result what can be engineered “into the vehicle” to minimise its effects on a driver. This scene may be familiar to some drivers – You are in a car and you know you are about to hit something. If you are the driver, you’re likely to hit the brakes and turn the wheel; if you’re a passenger, aware of what’s about to happen, your instinct is to brace yourself for impact. Latest initiatives from Toyota address what could be done differently. 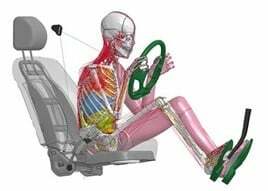 These changes in posture – relaxed or braced – aren’t something physical crash test dummies can copy, but Toyota has produced new software for its Total Human Model for Safety (THUMS) virtual human modelling that replicates these kinds of pre-collision reactions. The latest version of THUMS adds a muscle modelling feature that can simulate the body attitude of different vehicle occupants, from relaxed to braced, allowing for more detailed computer analysis of the injures collisions can cause. Until now, THUMS could only simulate changes in posture after a collision has happened, but the new Version 5 model allows changes prior to an impact to be scrutinised. This means the performance of seatbelts, airbags and other safety equipment can be studied more accurately, as well as more advanced pre-collision systems. The intelligence gained will help in the development of new safety technologies that can provide better occupant protection. THUMS Version 5 has already been adopted by dozens of businesses, including vehicle and parts manufacturers, and is contributing to vehicle safety research worldwide. About THUMS By simulating many characteristics of different parts of the human body, from its overall shape to bones and skin, THUMS enables detailed analysis of the kind of injuries that can occur in a vehicle collision, such as fractures and severed ligaments. Toyota began development of THUMS in 1997, working with Toyota Central R&D Labs. Version 1 was launched in 2002, followed by Version 2 in 2004, which added face and bones to the model; Version 4 in 2006, with a precise brain model; and Version 4 in 2010, which gained detailed modelling of internal organs. Well folks just when you thought things couldn’t get safer – Thanks to Crash Test Dummies they are. Till next time, Remember – all this research and technology is useless unless you use it. Buckle up and drive safe. With a long weekend just having passed and another starting tomorrow, I couldn’t help but note the number of motorbikes being ridden – myself being one of those riders. I know there are many more but the following ten are a minimum. 1. Over half of all fatal motorcycle crashes involve another vehicle. Most of the time, the motorist, not the motorcyclist, is at fault. There are a lot more cars and trucks than motorcycles on the road, and some drivers don’t “recognize” a motorcycle – they ignore it (usually unintentionally). 2. Because of its small size, a motorcycle can be easily hidden in a car’s blind spots (door/roof pillars) or masked by objects or backgrounds outside a car (bushes, fences, bridges, etc.). Take an extra moment to look for motorcycles, whether you’re changing lanes or turning at intersections. 3. Because of its small size, a motorcycle may look farther away than it is. It may also be difficult to judge a motorcycle’s speed. When checking traffic to turn at an intersection or into (or out of) a driveway, predict a motorcycle is closer than it looks. 4. Motorcyclists often slow by downshifting or merely rolling off the throttle, thus not activating the brake light. Allow more following distance, say 3 or 4 seconds. At intersections, predict a motorcyclist may slow down without visual warning. 5. Motorcyclists often adjust position within a lane to be seen more easily and to minimize the effects of road debris, passing vehicles, and wind. Understand that motorcyclists adjust lane position for a purpose, not to be reckless or show off or to allow you to share the lane with them. 6. Indicators on a motorcycle usually are not self-cancelling, thus some riders (especially beginners) sometimes forget to turn them off after a turn or lane change. Make sure a motorcycle’s signal is for real. 7. Manoeuvrability is one of a motorcycle’s better characteristics, especially at slower speeds and with good road conditions, but don’t expect a motorcyclist to always be able to dodge out of the way. 9. When a motorcycle is in motion, see more than the motorcycle – see the person under the helmet, who could be your friend, neighbour, or relative. 10. If a driver crashes into a motorcyclist, bicyclist, or pedestrian and causes serious injury, the driver would likely never forgive himself/herself. If not a biker – please share these tips with other drivers so that we can all be better road users. Till next time – Drive and Ride Safe. For those who haven’t been following the discussions on radio, and elsewhere, please take note that effective the 30th April 2015 legislation regarding the compulsory use of Child Restraints / Car Seats for Kids, will be implemented! South Africa is reported to have some of the worst drivers in the world, a fact substantiated by the deaths of some 300 plus per 1 million. This is somewhat disconcerting when compared with countries in Europe which are reported to have bad records of safety. Reflect on the following information which, by some haunting standard, is one that South Africans could only hope to achieve. Statistics reveal a stark east-west divide for traffic fatalities, with Belgium and Luxembourg having the worst records in Western Europe. The European Union is far away from achieving its goal of halving the number of road deaths between 2010 and 2020, according to statistics published today (24 March) by the European Commission. In order to reach the 2020 goal, an annual reduction of 8% is needed over the next five years, but figures show a year-on-year reduction of only 1% for 2014. In 2013, the reduction was 8%. “The figures published today should be a wake-up call,” said Violeta Bulc, the European commissioner for transport. The statistics show that the number of road deaths still varies widely across the EU, and there is a stark east-west split. Latvia had the highest number of road deaths in 2014, with 106 fatalities per million inhabitants. It was the only country with more than 100 deaths per million, and was an 18% increase on the previous year. Sweden and the United Kingdom had the fewest, each with 29 deaths per million inhabitants. Malta had only 26 deaths per million, but the country has no motorways. Among the countries of central and eastern Europe, Slovenia had the lowest fatality rate with 52 deaths per million, followed closely by Slovakia with 54. In contrast, Belgium and Luxembourg had the highest fatality rates in Western Europe, with 64 and 65 deaths per million respectively. While there are geographic patterns, Bulc said that the Commission has not found any direct correlation between a country’s economic health and traffic accidents. A number of factors can contribute to high fatality rates, she said, such as lack of enforcement of speed limits or traffic patterns. The Commission will issue a report with an in-depth evaluation of the situation in each country in May. Antonio Avenoso, executive director of the European Transport Safety Council, a campaign group, said that the drastic slowdown in progress toward halving road deaths was deeply worrying. The report issued in May by the Commission will also set an agenda for the coming five years. It will also come forward with a review of rules on training and qualifications of professional drivers next year. Certainly upon reflecting on the fatalities reported for the Easter Weekend (an increase) we do well to pay more attention to road safety – not less. Till next time -Drive Safe and spread the road safety message. Suffice it to say; reading the following report on what is happening in the UK should cause us great concern. Given that – in general – South African drivers are not nearly as law abiding or as well trained as their British counterparts the situation ( if all the information is known) will be considerably worse. Road safety campaigners are warning that mobile phone distraction will become a bigger killer on the UK’s roads than drink driving in 2015. The numbers of motorists using mobile phones to make calls, texts or social media updates whilst driving has risen and distracted driving is expected to be the biggest single cause of death and injuries on the roads in 2015 as a result. Transport Minister Patrick McLoughlin floated the idea to double the current penalty for mobile phone use to six points on a motorist’s licence. Department for Transport figures reveal that 378 accidents specifically involving mobile phone use were reported in 2012 — more than any year on record. Those accidents resulted in 548 casualties, including 17 deaths. But motoring experts say that this figure gives a false impression of the true scale of the problem, as many cases involving phones are classed instead as an “in-vehicle distraction”. In-vehicle distractions led to 9,012 accidents and 196 deaths between 2010 and 2012. Simon Marsh, managing director of incident video camera firm SmartWitness, said: “The problem is far more widespread than Department of Transport believes and driver distraction due to mobiles will soon be the biggest single cause of death on the roads. He added: “The only real deterrent is a one-year ban from driving for anyone caught texting at the wheel. It’s clear that the current legislation isn’t working and an increase to six points for mobile offenders will not be enough to stop the death toll. The number of offenders using a mobile when driving has shot up and recent research showed the number of motorists driving whilst on a mobile has more than doubled since 2009 from 1.2% to 2.6% in 2012. In 2012 583,686 drivers were fined £60 and received three points on their licence, more than ten times higher than the 55,300 convictions for drink driving at that time, and the age group of 18-25 that is most likely to use mobile phones whilst driving has seen the biggest rise in traffic deaths. In the USA several logistics firms are now installing SmartWitness cameras, with a second camera in the cab to make sure that drivers are not using mobile phones whilst driving. Marsh said: “The vast majority of people who use a phone when driving think it’s highly unlikely that they will get caught. “It’s not been thoroughly policed and the penalties aren’t that stiff so people are prepared to take the risk. Last year car manufacturer Volkswagen launched a viral campaign called “Eyes on the Road” to raise awareness of mobile use in Japan which they state is the “leading cause of death behind the wheel.” The video was watched over 26 million times. Till next time – hands on the wheel, eyes on the road and keep the cell phone in its proper place while driving. Yes – I know it’s Australia – but given our liking of and propensity to purchase ‘bakkies’ it is worth sharing the following information with our readers who are fleet owners. In the first half of 2014, 90 percent of new passenger vehicles sold held a 5-star ANCAP safety rating. However, only 55 percent of light commercial vehicles offered the same high level of safety. Road Safety experts in Australia continue to exert pressure on manufacturers to improve the safety of light commercial vehicles, which are currently granted regulatory concessions when it comes to safety. In 2014, the Great Wall V200 4×4 single cab once again achieved an unacceptably low score of only 3 stars. Among light commercial vehicles, it joined the Foton Tunland 4×4 dual cab and the Mahindra Pik-Up, both of which have only 3 stars. Alex Forrest, RAC Manager Vehicles and Fuels said a lower price point continued to pull buyers to some of the lesser rated commercial vehicles such as the Great Wall. For more information about new car safety ratings in Australia, feel free to contact us for the relevant sites reporting on vehicle safety. Over the years, we have seen on our roads a number of entry level (read affordable = improved mobility) vehicles, some of which have not featured all the relevant (some will argue essential and non-negotiable) active and passive safety features. Clearly the following research from the US highlights the benefits from driving “state of the art” vehicles, and how many lives are saved as a result. The question that can be reasonably asked is – how does this impact on us in South Africa and to what extent should this impact on our buying decisions? It’s not so much a case of ‘should all new vehicles have all the features or not’ but relates more to how this should be seen relative to the driver’s previous form of transport. Simply put – provided the driver is competent – the new vehicle is significantly safer than being driven in a TAXI with questionable roadworthiness and a ‘kamikaze’ pilot behind the wheel. The vehicles passive and active safety features become relative in the bigger picture, particularly when viewed from the benefits afforded new entry drivers in terms of employment and enhanced standards of living – all because of being mobile. While we can pontificate about safety (and for which all should be ardent supporters) we have to take cognizance of the buying public – such is the case with the buying public who have purchased the Datsun GO in the hundreds. The only caveat that should stand is: Let the drivers be properly qualified and trained. The research mentioned earlier indicates that drivers of late-model vehicles are a third less likely to die in crashes than they were a few years ago, but the gap between the best and worst vehicles remains wide. The chances of dying in a crash in a late-model vehicle have fallen by more than a third in three years, the latest IIHS calculations of driver death rates show. Among 2011 models, a record nine vehicles have driver death rates of zero. However, the gap between the safest and riskiest models remains wide, and three cars have death rates exceeding 100 per million registered vehicle years. Improved vehicle designs and safety technology have a lot to do with the continuing decline in fatality risk. In a related study, Institute researchers estimated how much of the decline was due to changes in the vehicle fleet during 1985-2012. They found that vehicle changes — including improved structural designs, the addition of safety features and an evolving mix of vehicle types — were the main source of declining risk from 1993 through 2006. These changes continued to contribute to later declines as well, though other factors such as the weak economy also appear to have played a role. What do we learn from this: It is highly desirable to have the best, but the best is probably that which we can afford? Till next time – Drive Safe and be sure that your vehicle is safe. Many vehicle drivers unintentionally exceed the speed limit, often without realising it. Modern cars are so powerful and comfortable they give drivers little sensation of their speed. It is too easy to creep above the limit, and in particular, many drivers believe it is difficult to drive a modern car at no less than 60 KPH on a road with a 60 KPH limit. Ultimately drivers are responsible for the speeds at which they choose to drive, but there are some simple and practical things drivers who find it difficult to stay within speed limits can do to help themselves. Even a small amount above the limit makes a big difference. Refresh your skillson a refresher driver training course. Drivers who travel at higher speeds have less time to identify and react to what is happening around them. It takes them longer to stop. And if there is a crash, it is more severe, causing greater injury to the occupants and any pedestrian or rider they hit. Research in the UK shows that excessive speed contributes to 15% of collisions in which someone is killed, 6% of crashes resulting in a serious injury and 4% of all injury collisions. In 2013 the results in the UK showed 249 people were killed in crashes involving someone exceeding the speed limit and a further 209 people died when someone was travelling too fast for the conditions. For many who subscribe to the belief that “it’s not speed that kills but rather the inappropriate use of speed “will be pleased by what this research also highlights. Approximately two-thirds of all crashes in which people are killed or injured happen on roads with a speed limit of 50 kph or less. At 60 kph a driver is twice as likely to kill someone as they are at 50 kph. To put this into perspective remember that a vehicle traveling at 60 kph, vehicles travel 33 m (about 4 car lengths) every second. Even in good conditions, the difference in stopping distance between 50 kph and 60 kph is an extra 6 (or so) meters, more than 2 car lengths. For pedestrians struck by cars, the risk of being killed increases slowly until impact speeds of around 50 kph, but above this speed, the risk increases rapidly. A pedestrian hit by a car travelling at between 50 kph and 70 kph is 3.5 to 5.5 times more likely to be killed than one struck by a car travelling at less than 50kph. Elderly pedestrians have a much greater risk of suffering fatal injuries than other age groups. For car occupants, the risk of being in a collision with another vehicle also increases with speed. The risk is much higher in a side impact than in a frontal impact. So remember, that while some may think it’s “cool” to speed, if this is done in an inappropriate manner or venue the consequences could be disastrous and devastating – not just for the victim. Till next time – Keep safe and Don’t speed. This weeks’ topic of discussion is traffic circles and mini traffic circles. Since their implementation traffic calming circles have been a source of confusion, irritation and frustration for motorists. We thought we should use this opportunity to look at the facts around (excuse the pun) their use and the function they perform in certain areas. The following comments are from our Training Director, Derek Kirkby, who has shared – in simple terms – the actions drivers should take when negotiating circles. While researching information on the psychology associated with people who habitually do wrong things and more specifically, in an inappropriate situation, I came across the following material. Rather than dilute the impact of it by commenting on the content I would prefer to share it in an un-edited version – and NO it doesn’t mean that we agree with the actions. It rather helps us understand why it happens, which in turn could assist in managing those situations better or differently!!! Be sure to follow the links – there is additional material there. Till next time – Drive Safely and when you pass a school think on how you could ensure that YOU slow down!!! An incident several weeks back in which a motorcyclist was “killed” is no doubt still fresh in our minds. The follow on (which includes grief, remorse, possibly many more emotions) no doubt being analysed by many people and or organisations. Of course we empathise and also sympathise with all parties involved. When I read the above, my thoughts immediately went to each and every one involved in this initiative. Whether it be by way of partnership, sharing of knowledge or spreading the message. You are all people that I would follow voluntarily any day. How privileged we are to have such a dynamic group of people with incredible knowledge and expertise in our Brake & Tyre Watch Family. From the FleetWatch camp, we want to once again thank you for investing your funds, time, energy and passion into this project. We know, and will acknowledge it at every opportunity we get, that without all the passion and commitment from our valued Partners, we would never be able to do this project. As you can see, shocking results on a road that thousands of people will travel during this festive season. But by making sure that some of the culprits (as we know that are a lot more) were taken off the road, you can all stand proud knowing that the result might be one life saved. For this, we applaud you! Thank you for your support during 2010. We look forward to further making a difference with you by our side through 2011. May you and your loved ones have a blessed festive season and safe travels should you find yourself on the road. Suggestion: DON’T DRIVE NEXT TO, IN FRONT OF OR BEHIND ANY TRUCK! Any “half decent” vehicle today has a few airbags as standard fitment. As new models hit the showroom floor there is an increasing number being fitted, and for good reason, as their benefits become more apparent. Based on analysis of data from the Fatality Analysis Reporting System, NHTSA estimates that curtain plus torso airbags reduce the risk of a driver or right front-seat passenger dying in a near-side crash by 31 percent, and combination head/torso airbags reduce the risk by 25 percent. Curtain airbags alone lower the risk by 16 percent, while torso airbags trim the risk by 8 percent. In side-impact crashes, the side structure of the struck vehicle or the structure of the striking vehicle can injure even properly belted occupants. In some cases, occupants collide with nearby objects, such as utility poles. Side airbags cushion and spread the load of these impacts to prevent any part of an occupant`s body from sustaining concentrated impact forces. Side airbags that offer head protection are particularly important because they may be the only thing between a person`s head and the front of a striking vehicle, a tree or other object, or the ground in the event of a rollover. All of the vehicles that earn good ratings in the Institute`s crash test assessing occupant protection in side impacts have head-protecting side airbags. These vehicles also have side structures that resist major intrusion into the occupant compartment. NHTSA doesn`t mandate side airbags specifically but does require a high level of head and torso protection for occupants in side crashes. Vehicles roll over in less than 3 percent of all crashes, but these crashes account for more than a third of passenger vehicle occupant deaths. When vehicles do roll, side curtain airbags can prevent an occupant`s head and upper body from contacting the ground and also keep unbelted people inside the vehicle. In addition, safety belts hold occupants in their seats and inside the vehicle when people use them, while strong roofs that resist occupant compartment intrusion reduce the risk of serious injury and death. Notwithstanding the implementation of all these passive safety aids there is still the need for motorists to exercise defensive driving skills while on the road – thereby minimising the possibility of a crash. Till next time – Safe driving and remember to buckle up, airbags don’t replace seatbelts. There is no doubt that motorcyclists have a torrid time, given the standard of driving in South Africa. That said, there are a fair share of bikers who are equally as annoying to other drivers as they weave through traffic. No doubt, this is a challenge, which the UK has addressed with a campaign dedicated to improving their crash statistics. Reflecting on their campaign may be a lesson for us South Africans. The campaign “THINK” in the UK was launched to encourage drivers to take longer to look for motorcyclists after figures revealed that 30 bikers are killed or injured every day at junctions. Announced by Road Safety Minister Robert Goodwill, the “Didn`t See” campaign was run for four weeks on national radio with the aim of reducing the number of motorcyclist and driver collisions on British roads. Robert Goodwill said: ‘Every day more than 30 motorcycle riders die or are injured in accidents at road junctions. Often, though not always, this is because a driver has pulled out in front of a rider. Motorcyclists in the UK make up just 1% of traffic on the roads but 19% of all fatalities. They are 55 times more likely than car drivers to be killed or seriously hurt in an accident. THINK!also launched a new campaign encouraging motorcyclists to undertake further training and to ride defensively to help improve their safety on the roads. This should be of particular interest to South Africans as summer approaches and more leisure riders take to the roads. So to all road users remember – look for bikers. You could save a life! In the preceding months there has been a significant increase in our truck driver training courses. What is becoming increasingly obvious is how “ignorant” the drivers of light motor vehicles are when it comes to interacting with trucks – sometimes resulting in serious consequences. With that in mind we are sharing the video below as it graphically illustrates some of the danger zones we may inadvertently be occupying while in close proximity to heavy vehicles. Drivers of cars sometimes assume that drivers of tractor-trailer trucks can see the road better because of their higher vantage point. But the truth is heavy trucks have major no-zones, or blind spots, that can dramatically limit the driver’s ability to see other vehicles on the road. That’s why it’s important to remind drivers of this simple rule: If you can’t see the driver’s face in the side mirror of the truck, the driver can’t see you. This video, produced by the Utah Department of Motor Vehicles, explains where these truck no-zones or blind spots are. A solid understanding of these blind spots can help a driver avoid placing their vehicle in a precarious position. You may want to pass this advice along as a friendly reminder to other road users who are not as familiar with the challenges truck drivers face. Yes we know it is in the US which means we ask you to keep the following in mind – the steering wheel is on the wrong side and you should measure in metres not feet, but aside from that the warnings are relevant. Follow the reasoning and, together, we should enjoy a safer drive. Till next time – Safe Driving and Remember to “Spot the Driver”. What Has Technology Done To Our Driving? Cell phones aren’t the only things that technology has changed. Modern vehicles are significantly different from what they were just 10 years ago. How has their technology affected you, positively or negatively? Here are a few things to reflect on. A number of new vehicles (including some MCV’s) have back up cameras. Before these cameras were made available, you had to either turn around to see what’s behind you while backing or use your rear view mirror which, by the way is better, as you get to use your peripheral vision to notice movement before a person gets behind your vehicle. The rear view camera can only show you the rear of the vehicle. Danger from behind doesn’t always originate from the rear; it can also come from the sides. By the time one spots the pedestrian behind, it could be too late. Some vehicles have flashing lights on their side mirrors that activate when someone or something is approaching the vehicles’ blind spot. Before these sensors were made available, one had to check their mirror and blind spot before changing lanes. Consider what could happen if the sensor was covered with mud or snow? One can’t really guess that another vehicle is in the blind spot? It’s amazing how easily we can get used to our technology in our vehicle and when it’s broken or when we drive a different vehicle, one feels lost. For these types of technologies, drivers may develop weak habits and trust the technology forgetting how to do those things themselves. Is that the proper direction drivers should go in with all of this new technology? If drivers remember to use their mirrors regularly, you’ll know if another vehicle is entering your blind spot. Keep your short term memory sharp and never drop your guard. Other technology makes driving a vehicle and servicing a vehicle so much easier for the driver and vehicle owner. Technology has made vehicles smoother to build, drive and maintain. The cost of maintenance has been reduced in many cases because of this advanced technology the automakers have done. However, should drivers also drop their guard because they feel nothing will go wrong with their vehicle? This advanced technology was made by humans. Humans make mistakes. The advice to all drivers and vehicle owners is not to drop their guard with maintenance either. New technology for vehicles is amazing and that makes driving these vehicles awesome. However, take the responsibility that something may still go wrong and the driver may need to take over. At this point we haven’t even touched on the use of “forward distance monitoring” devices or “lane control assist” as they herald a new era of ensuring that when we change cars we change our “mind-set” as well. Remember – Drive Safe and protect the best technology you have – your brain, which is the best technology sometimes. Almost seven of 10 people who acknowledged they shouldn`t have driven said they were sleepy, according to a new survey from CarInsurance.com. 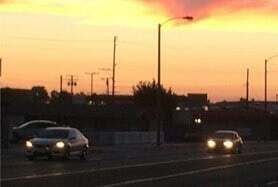 Drowsy driving ranked at the top of seven conditions listed in the survey that should have caused drivers not to get behind the wheel. Survey respondents also widely supported (60 percent) making drowsy driving against the law. Of the people who drove when they shouldn`t have, 68 percent said they were sleepy at the time. Other excuses included a headache (53 percent), sick enough to be in bed (35 percent), less drunk than a friend (23 percent), not wearing needed glasses or contact lenses (16 percent), taking narcotic pain medicine (15 percent), and one arm in a cast (8 percent). Insurance carriers would still likely cover repair costs from a crash unless a person`s doctor specifically asked them not to drive. In the 12 months preceding the survey, 46 percent of respondents said they drove once or twice against their better judgment. The survey also identified 11 vehicle malfunctions drivers ignored while driving, including 61 percent who saw the “check engine” light on. Other vehicle problems included not being able to see through snow or ice on the windshield (32 percent), windshield wipers not working (26 percent), speedometer broken (21 percent), horn not working (19 percent), flat tire (17 percent), door that had to be held closed (10 percent), no required child seat for child (7 percent), car filled with exhaust fumes (6 percent), and no driver seat or a broken driver seat (5 percent). Additionally, 79 percent of people said they didn`t drive when others persuaded them to hand over the keys. The 21 percent, who resisted that advice said they drove to go to work (21 percent), go home (13 percent), go to the doctor (4 percent), or pick up children (3 percent). The survey polled 2,000 drivers in December. Who hasn’t heard of the road rage incident involving the passenger of a Porsche motor vehicle? Thanks to YouTube many have not only heard of it but have also viewed it – probably with disgust. Ever wondered what causes it and possibly even considered how close we may have come to being guilty of it? The following article (to shorten it would have done injustice to the subject) covers some valuable insight into the phenomena of ROAD RAGE!!!! Till next time – Drive Safe and keep it cool. Road rage is something that affects all drivers. At best, an incident can cast a black cloud on your day and negatively alter your mood; at worst, it can result in a verbal or physical confrontation, injury or something even more serious. We may hear reports of the most serious cases in the news and see videos of them online, but there are disagreements between frustrated, angry and impatient motorists on a daily basis – making gestures, shouting and sounding horns. In a recent survey conducted by black box insurer Ingenie, 70 per cent of respondents said they’d been a victim of road rage in the past 12 months. And although 65 per cent of those surveyed didn’t consider themselves to be a ‘road rager’, 85 per cent admitted to showing signs of road rage on occasion. So what causes road rage? Can it be prevented and ‘coached’ out of drivers? Is there a specific type of road user more susceptible to experiencing it? Dr Lisa Dorn has devoted her career to researching and understanding such situations. A Reader in Driver Behaviour at Cranfield University in Bedford, she has managed research programmes on driver risk assessments, run courses at Cranfield on driver behaviour, and is co-editor of the book series ‘Human Factors in Road and Rail Safety’. “When I started in this field, there were 6,000-7,000 deaths a year on UK roads,” says the psychologist. “Now that figure’s edging towards 1,700, which is still too high, but it’s improved significantly. So what is it that drives motorists to act in such a way? Well, people take risks that have nothing to do with their skills or knowledge; they take them because of their emotional condition, the situation they are in. There are, obviously, parallels with individual personality and driver behaviour. “If you have a sensation-seeking character, looking for a buzz, that can often be expressed when driving if you’re in the relevant situation; in the country, open road, hilly, twisty roads, a sunny day,” says Lisa. She goes on: “You need to develop the ability to self-reflect on your personal driving style. If you think about it, once you’ve passed your test you never have to do anything again. There are so many times in your driving career where the risk to your performance is heightened. This approach requires the driver to consider how his or her performance could be affected, on any given day, by other factors and circumstances. The roadworthy condition of the vehicle is important, naturally, but what about the condition of the driver? Is there anything that could compromise the safety of their handling of the vehicle? Running late? Tired? Distracted, still, by a conversation with a work colleague the day before? All of these things can have a negative impact, and compromise the mental state of the individual behind the wheel. Lisa recommends a driver asks themselves that pointed question before getting into the car: how is my driving going to be affected today? Other expert advice includes looking for a safe opportunity to allow an impatient driver, who may be tailgating closely behind your vehicle, to overtake and pass; focusing on the present moment and your driving, rather than the destination; holding a hand up by way of apology to a fellow motorist if you’ve made an error while driving, and refraining from making eye contact with an aggressive driver in a confrontational situation. Why do some people get so enraged by another motorist’s behaviour on the road? “It’s like looking through a distorted lens, and the person in front of that distorted lens becomes someone who is trying to stop them from achieving their goal,” explains Lisa. “And some people really take it personally. “Mostly people are just being human, maybe being a bit thoughtless, but not trying to take risks deliberately. But that distorted view then gets established over time, coupled with personality and emotional factors, and some people are almost waiting for a situation to happen. People get angry and have difficulty controlling their impulses, and let off steam – they almost have a tunnel vision and fire off an outburst of some sort. “But when someone is angered, that stress rattles them and means they can’t process traffic data as effectively. That affects driving performance.” Road rage and angry behaviour isn’t exclusive to a gender or age group. But men are more likely to be involved in an incident, while youngsters can struggle to keep cool. So, the next time you get in your car, give due consideration to your own attention and performance on the road. Ensure your driving is as safe as it can be, and don’t let your frustrations get the better of you. After all, staying calm is the best way of staying safe. Ask me what I dislike most about motorists and I will unequivocally answer – drivers who allow their children to travel in a vehicle while standing on the seat (front particularly, but equally as bad in the rear). The driver ( as apparent in most instances ) may well be in a position to choose whether they wish to be maimed or killed as a result of being unrestrained but the driver has no right to decide on behalf of the child they are transporting. Grossly irresponsible at best, a murderer at worst!! Drivers, beware! A new study claims rear-end collisions are on the increase despite strong efforts from motor manufacturers to help combat the problem. How often do you, when driving on a highway (or other roads for that matter) get the feeling that the vehicle behind is much to close? Probably worse if this is a big truck or at higher speeds. A statistic, I seem to recollect having emanated from the JMPD, indicates that 80% of rear end collisions are as a result of incorrect following distance – we recommend a minimum of 3 seconds (allowing for more in inclement weather and heavy vehicles). Research by Accident management firm Accident Exchange in the UK indicate their research has uncovered a 7% rise in the number of rear-end crashes over the past three years and account for over a third of all accidents. What is interesting, according to Accident Exchange, is the fact that although most modern vehicles are now better equipped than ever to avoid collisions these crashes are on the increase. New cars benefit from advancements like improved braking systems such as ABS, as well as the development of collision avoidance systems which can even be fitted aftermarket. While the report offered no obvious explanation for the increase given the improvements in vehicle safety over recent years the following was worth noting. It was postulated that a contributory factor could come from increased connectivity providing the modern driver with a greater number of distractions, some of which we know to be mobile phones, tablets and entertainment devices. Regular readers will know that we have long commented on the dangers of DWD and, with more and more APPs becoming available for smart phones, we need to apply our minds ( and policies ) to changing driver behaviour and maybe, just maybe we can lessen those rear end collisions. Till next time – drive safe, lay off the mobile and keep your following distance. No doubt every Gauteng driver is by now an “expert” wet weather driver and will be able to deal with any and every challenge associated with our current situation – Ok, stop laughing!!! Clearly, judging by the number and frequency of collisions, most drivers need to be reminded of some basic facts which, if applied, will positively impact on their journey. For the competent drivers (even if you only think you are) who may not think they need the information please humour us and, at least, pass this on to another ‘deserving’ person. The speed limit is just a start; drivers need to adjust their speed to match their immediate driving conditions. The three factors that should always be considered are visibility, traffic, and traction. Solution: If visibility is minimized or if the road is wet, snowy, or icy, you should slow down significantly. This will give you more time to respond to any incident, and help prevent a loss-of-traction situation. Even in clear, dry conditions, it is easy to overload the one tyre that ends up being asked to do the most when a driver attempts to do more than one thing at a time, such as turn and brake. In wet conditions, the risk of losing traction is increased significantly when a driver attempts to force the vehicle to do two or more things at once. Solution: Do one thing at a time — brake, then steer/turn, then accelerate. This will help prevent demanding too much of the tyre that takes the brunt of the traction requirements, thereby reducing the chance of a loss-of-traction situation. Solution: Heads Up -Get those eyes moving. Work on looking further ahead (12 – 15 seconds), and also predicting what other drivers might do that could create problems. Detecting potential problems ahead as early as possible can make the difference between a collision and a near miss. Most drivers fail to maintain enough space between their vehicle and other vehicles around them. Frequently, drivers position themselves too closely to the vehicle ahead. But, maintaining “open” space to the sides is also critical — you may need to move into that space quickly. If you don`t have that space, you`ll be without an effective option to prevent a crash. Solution: Back off a bit and lift up on the accelerator to keep an open space to at least one side of the vehicle. Space is your best friend out on the road — to the front, sides, and rear. It`s hard to collide with something if you have plenty of space around the vehicle. Driving in poor weather requires your undivided concentration so that you can constantly adjust your speed and position, and detect any potential problems as early as possible. A ‘shiny’ patch on the road ahead – a diesel spill – could indicate tyres possibly losing traction, or another vehicle pulling out into your lane. If you add other tasks to driving, such as using a cell phone or changing the radio station your risk increases dramatically. Solution: Stay focused on driving. Get there, and then get busy with non-driving activities. Common sense precautions include programming navigation systems and adjusting music selections before driving, and, of course, ignoring the cell phone. So, even if you are an expert driver we are sure that the reminders noted above and worth sharing with colleagues, family and even friends. Ask me what I dislike most about motorists and I will unequivocally answer – drivers who allow their children to travel in a vehicle while standing on the seat (front particularly, but equally as bad in the rear). The driver ( as apparent in most instances ) may well be in a position to choose whether they wish to be maimed or killed as a result of being unrestrained but the driver has no right to decide on behalf of the child they are transporting. Grossly irresponsible at best, a murderer at worst!! Its holiday time and everyone – including the pets – are so focussed on reaching their destination (the park down the road or the coast) that, aside from the obvious, little thought is given to the safety of the pets being transported. A sponsored survey in the US found that an overwhelming 84% of survey respondents said they have driven with their pets on a variety of car trips. Only 16%, however, said they used any sort of pet restraint system to make sure their dog didn’t distract them. Many drivers have become used to securing their human passengers – for obvious reasons – but don’t necessarily realise that unrestrained pets inside the vehicle can cause driver distraction, and are also a danger to other passengers in the event of a crash. Here are some tips from MasterDrive. Restrain pets in the back seat. A vehicle’s air bags can prove deadly for pets. Padded harnesses with sturdy connectors and straps are available to connect to a vehicle’s seatbelt or LATCH system. Both hard- and soft-sided crates can be used in vehicles, but should always be strapped down. Pet car seats (where available) or basket-style holders can be used with smaller dogs. A wide variety of barrier systems are available to fit various makes and models (particularly wagons and SUV’s) of vehicles. These are not only helpful in reducing distractions, but they don’t offer protection during a crash. Till next time – Be wise and make sure that you do not become the unintended victim of a crash due to inadequate thought regarding pet safety. Parliament, Wednesday 4 May 2016 – The Chairperson of the Portfolio Committee on Transport, Ms Dikeledi Magadzi, has expressed concern on the increase of road accidents and the rate of fatalities. A number of fatal accidents were reported over the past couple of weeks. During the weekend eight students from Wits University travelling from Polokwane died on their way back from a church pilgrimage. A week before that a bus accident claimed 11 lives when it overturned in the Free State. The people were travelling back after attending a political party manifesto launch in Port Elizabeth. “These accidents are becoming frequent, fatal and often involve minibus taxis. This is concerning to the Committee as any situation resulting in unnecessary death on the roads is intolerable,” Ms Magadzi said. 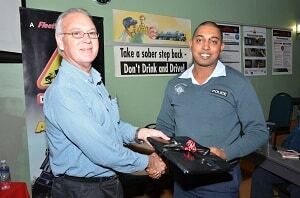 “This is particularly shocking because we had a significant reduction of road fatalities during the Easter weekend. What has changed for the country to be losing people at this rate in such a short space of time?” she asked. Ms Magadzi said she supported the utterances by the Road Traffic Management Council (RTMC) that it will investigate this recent spike. “The Committee welcomes this initiative by the RTMC and would want it expedited so that whatever is necessary to curb road deaths is implemented speedily,” she said. “Behaviour on the roads, especially by young people, should change and the Committee is satisfied that traffic laws are oriented in such a way that the country is safe. We need to instill a culture where road safety becomes a personal responsibility and negligent behaviour is eradicated,” she said. Surely as a Department and the Road Traffic Management Corporation tasked with the responsibility of road safety, cannot sleep peacefully when thousands of our road users are mowed down on our roads by irresponsible road users. We cannot have peace of mind when innocent children are left in a state of agony, permanent emotional and psychological torture while awaiting the arrival of their parents who will never make it home alive. An estimated 75,000 people aged 15-34 were killed in road crashes in India during 2014. This accounted for 53.8% of India’s total road crash fatalities for 2014, around 129,300 in all. The data comes from India’s 2014 Road Accident Report by the Road Transport and Highways Ministry. The report also revealed that 84% of those 75,000 killed were males. The data is in line with World Health Organisation`s report that road crashes are the number one cause of death among people aged 15-29 globally. The 2014 Road Accident Report by the Road Transport and Highways Ministry also revealed that road crashes in India during 2014 stood at 489,000, an increase from 486,000 in 2013. Meanwhile road fatalities increased 1.5% during 2014 compared to 2013. SARF is proud to be one of the partners that were involved in the Brake and Tyrewatch initiative in Umdloti KZN on 12 and 13 August, ETV and the Newspapers were invited to the event. Please click on the link below to view the report that was shown on ETV News on 13 August. The updated Brake and Tyrewatch stats have been included as well as a Newspaper report from North Glen News. 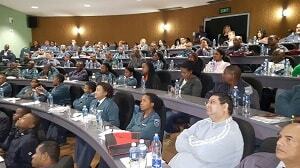 The photos show a large group of eThekwini Metro Police at the first day’s technical training session. Basil Jonsson handing over a prize to one of the eThekwini Metro Police, the third photo shows Craig Procter Parker pointing out faults on the truck that was randomly stopped on the N2 Freeway. “Infrastructure and education can save thousands of children’s lives,” says the South African Road Federation (SARF). Around 186 300 children under the age of 18 years die from road traffic crashes around the world each year. Road traffic crashes are the leading cause of death among those aged 15-19 years, the second leading cause of death for those aged 5-15 years, and the fourth leading cause of death among young people aged five to nine years. Millions more children are injured each year and require hospital care for non-fatal injuries as a result of road traffic crashes. Furthermore, rates of road traffic death are three times higher in developing countries than in developed countries. This is according to the World Health Organisation (WHO), which is facilitating the UN Global Road Safety Week, together with the United Nations regional commissions. The Global Road Safety Week is currently underway in Sydney, Australia, from 4–10 May 2015 under the theme ‘Children and road safety’. The South African Road Federation (SARF) is a participant in support of the UN Global Road Safety Week 2015, and is currently sharing local experiences with global participants at this event. “SARF is dedicated to the promotion of the road industry and road safety in South Africa by dissemination of information, the promotion of sound policies and by education and training,” says Hilton Vorster, Chairman of the South African Road Federation Road Safety Committee. “The main (non-natural) killer of children in South Africa is road traffic crashes. The majority of these are pedestrians and secondly passengers, who are not adequately restrained,” he adds. This year’s Global Road Safety Week seeks to highlight the plight of children on the world’s roads, generate action to better ensure their safety, and promote the inclusion of safe and sustainable transport. At the centre of this event is a child declaration, developed with input from children around the world through the #SaveKidsLives Campaign. Through this declaration, children stated that there is no reason why thousands of innocent children should be killed and injured on the world’s road every single day. They stated that not enough is being done, and that the world’s leaders need to listen and act. In terms of infrastructure, the declaration indicated that all children deserve a safe journey to and from school without the fear of injury or death. Roads must be made safer to allow children to walk to school. This includes the development of safe foot-paths and cycle-paths, safe crossing areas and traffic calming measures. “It is essential that the relevant authorities respond to this plea by providing safe infrastructure for children to ensure a safe journey to and from school. This includes the provision of adequate walkways, raised pedestrian crossings, pedestrian bridges and crossings,” says Vorster. “The implementation of this infrastructure should then be followed by ongoing education to learners, parents and educators on how to correctly use this infrastructure,” he added. “If we can achieve this from an engineering and educational point of view we will contribute greatly to the reduction in child fatalities and serious injury,” concluded Vorster. This initiative is designed to raise transport operators’ awareness around the subject of efficient braking and tyre checking and is linked to preventative maintenance on trucks, including all safety critical items such as lighting, reflective, etc. Road crashes have a major human and financial cost to the UK. Hospitals record 40,000 serious injuries each year and 1,700 people were killed in 2013 devastating the lives of those involved and their families, friends and colleagues…. Please take the time to review this document. This will be included on the memory sticks that will be handed out at the IRF Safer Roads by Design Across 6 Continents Comprehensive Certified Training Program in Orlando in three weeks. Isn’t it amazing how many things we take for granted – everyday things that we interact with on our daily drive, be it during the day or even at the end of a day’s commute from the office. In many instances, these are external influences – such as traffic lights – and until they cease to function in the way we expect them to, we don’t notice anything. This is no different in the interior of our vehicles. Drivers end up keeping many items within arm`s reach( for convenience ) while driving, such as sunglasses, coffee flasks , smartphones, even tablets; however, there is a latent danger in keeping these items nearby instead of ensuring they`re properly stowed while driving. For the majority of drivers, the dangers of loose objects are never factored in on their risk assessment. A well-known training organisation in the states refers to these as ‘UFOs,` or unnecessary flying objects. Unfortunately, we don’t have any stats in SA but a 2012 study by Safety Research and Strategies in the US found that ordinary objects in cars and trucks are responsible for 13,000 injuries each year. Putting aside the issue of direct contact and harm to the driver of a vehicle, the hazards related to emergency braking when loose objects fly around are extremely serious .When a situation arises that requires a driver to engage in emergency braking procedures this manoeuvre sometimes is not completed . On investigation, this isn`t because the driver lacks the requisite, the skills or an escape route, but simply because a loose object becomes lodged under the brake pedal. inspecting drivers can momentarily become visually distracted (impaired) by an object catapulted through the cabin or by liquids spilling onto him or her. And, while loose objects add to the risk of a dangerous injury or fatality during a crash, Safety Research and Strategies estimated a driver`s risk of dying in a car accident increases by 25 percent if there are unrestrained passengers in the vehicle. As a driver — in addition to securing loose objects to stay safe — make sure your passengers do not have the potential of becoming `UFOs.` Insist that everyone buckles up before you start your trip – especially children, even if their resistance is emotional blackmail. Non-compliance is not an option. Keep all bulkier, heavier items stored in the vehicle`s boot or use storage net in the case of an SUV. Unless an item (such as a GPS device) has a secure clip-in system, store all such items in a closed compartment. When inspecting vehicles, ensure proper storage options are provided if drivers typically must carry files and/or lap tops with them. Bottom line, drivers must be made aware of the often forgotten, but potentially fatal danger of loose items in a vehicle during a crash or sudden braking action. Include instructions in the fleet`s policy directing drivers to secure all loose items before operating a vehicle. Question – is this covered your company vehicle policy? Until next time – Drive Safe and avoid the UFO’s. Distracted while driving (DWD) is a major problem in most developing countries that have identified the use of Cell phones, while driving, as a causative factor in some 25 % of crashes. Just when we thought that we had conceived the worst example of cell phone use (abuse) with the downloading of apps while driving as well as communicating with friends via Facebook, then a new phenomenon surfaces – selfies. A recent word to the official dictionary this has been the subject of research by Ford in Europe. Ford conducted research in seven EU countries which found that young British drivers are the most likely to take a ‘selfie’ while driving. The survey was conducted of 7,000 smartphone users aged 18-24 from across Europe and results revealed that, British drivers were the most likely to photograph themselves while on the move (33 per cent), ahead of counterparts in Germany (28 per cent), France (28 per cent), Romania (27 per cent), Italy (26 per cent), Spain (18 per cent), and Belgium (17 per cent). Even though nearly all drivers surveyed agreed the activities were dangerous. Shocked are you? Well no doubt many others share your sentiment but in all probability many of those, if given the opportunity to “take a selfie” may well likely succumb. While we obviously don’t have any idea what the state of affairs is in South Africa we can, in all probability conclude that it should be a lot worse given our penchant for breaking the law. All drivers should take a moment to reflect on the reality that, while they may excuse using a cell phone, it is aside from DUI, one of the most dangerous activities undertaken by road users. A similar survey by ETSC’s member Liikenneturva found a third of drivers admitted reading text messages or Facebook while driving. In Europe, transport accidents remain the largest single cause of death among people aged 15 to 29. General Motors is planning to introduce new sensor technology in its cars to warn drivers of lapses in attention either due to fatigue or distraction. The Belgian Road Safety Institute has launched a new communications campaign targeting drivers who use their mobile at the wheel. The BRSI say 1 in 3 Belgian drivers admits to sending an SMS while driving and almost half say they have made a call while holding the phone in their hand. Well folks be warned – it may seem like a “cool” thing to do at the time but rest assured it just isn’t worth the risk. 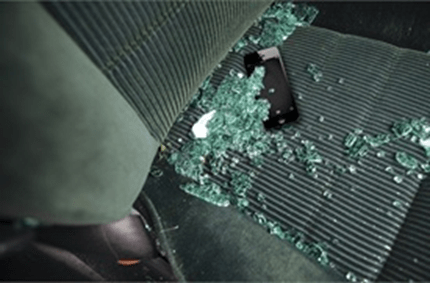 Remember – Drive Safe and keep your phone where it belongs, away from prying hands. No doubt all have watched with interest the legalisation of Marijuana in the US and the different reactions to this from different sectors of society. The most recent information from the US lends better perspective to the unintended consequences of these changes in legislation. As the nation eases marijuana laws, road safety advocates worry that highway rules for driving under the influence of pot are lagging, which could lead to fatal crashes. Medical marijuana is legal in 23 states and Washington, D.C.; adult recreational use is legal in Washington state and Colorado; marijuana has been decriminalized in 16 states and Washington, D.C. The research is mixed on how cannabis affects driving performance. Though marijuana can slow decision-making and decrease peripheral vision, drivers under the influence of marijuana tend to drive more slowly and less aggressively, says Jonathan Adkins, executive director of the Governors Highway Safety Association. A study published in January in the American Journal of Epidemiology found that fatal crashes involving marijuana use tripled during the previous decade. Researchers from Columbia University`s Mailman School of Public Health studied fatal crash statistics from six states; they found that marijuana as a factor in fatal crashes rose from 4% in 1999 to 12% in 2010. Drugged driving overall rose from 16% of fatal crashes in 1999 to 28% in 2010. The study authors found that combining alcohol and marijuana significantly increases a driver`s risk of death. A driver under the influence of alcohol is 13 times more likely to be in a fatal crash than a sober driver; a driver under the influence of alcohol and marijuana is 24. Road safety advocates generally agree that one of the key ways for law enforcement to combat drug-impaired driving is with drug recognition experts, specially trained police officers who can take a suspected drugged driver through a series of screens at roadside to narrow down the class of drug that is most likely impairing the driver. With the enormity of the challenge facing drivers in South Africa we trust that all users will take cognizance of the effects drugs – all drugs including OTC medication – have on our driving. Ontario is launching its annual seatbelt campaign to remind drivers and passengers to buckle up and make sure children are properly secured in the right child car seat or booster seat. Police, fire and emergency services workers, health care professionals and road safety groups across the province are participating in the campaign, which runs until Oct. 10. It includes educational demonstrations, seatbelt enforcement by police and a series of child car seat inspection clinics. Wearing a seatbelt and using the right child car seat or booster seat is the most effective way to reduce the risk of injury or death in a collision. Ontario`s One Person, One Seatbelt law requires every occupant in a motor vehicle to buckle up properly. Drivers must also make sure all passengers under the age of 16 are properly secured with the appropriate child car seat, booster seat or seatbelt. Drunk driving in South Africa is not to be taken lightly and drinking and driving is a very serious offence. The gravity of drunken driving charges should be enough to frighten anyone away from driving drunk, but there can also be far more grave repercussions that can occur when drivers don’t watch their blood alcohol limit – these can be fatal consequences. Under the auspices of its Group of Experts on Road Safety, IRF has launched a set of comprehensive Guidelines for the Development of Road Safety Master Plans. Guidelines for the Development of Road Safety Master Plans.